Wentworth is the region’s oldest town, located at the junction of Australia’s two largest rivers, where the Darling ends and joins the Murray. Its location made Wentworth an important port in the paddle steamer era. Once the busiest inland port in NSW, it was considered as the site for the Australian capital. In 1829 exploration parties headed out west of Sydney towards the then unknown Murray and Darling rivers in an endeavour to discover an inland sea. Although no inland sea was found, Captain Charles Sturt, entered the headwaters of a wide river which he named the Darling. 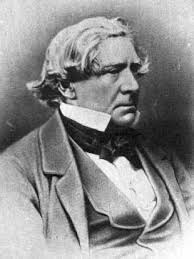 On his return to Sydney a Government conceived expedition then sent Sturt to trace the Murrumbidgee River. It was during this expedition that he entered a mighty river which he named the Murray. 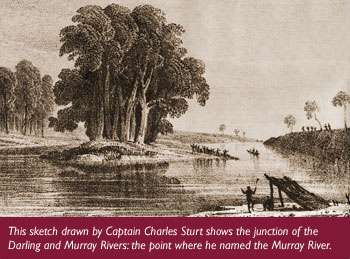 In 1830, while navigating the Murray, he came across a river junction which he was convinced was the Darling. Joseph Hawdon and Charles Bonney drove cattle overland from New South Wales to Adelaide along the Murray and arrived at the Darling/Murray junction in 1838. Other overlanders followed the route, which became known as the Sydney/Adelaide ‘highway’, and the river junction spot became an established camp site known as Hawdon’s Ford. The actual junction at the time was called “The Rinty”. The settlement was later referred to as the “Darling Junction”. A number of squatters established reign over the land along the Darling and Murray Rivers, expanding their holdings westwards from the Murrumbidgee area and north eastwards from South Australia. In the mid 1840’s the settlement was known as McLeod’s Crossing”, named for the first white residents of the settlement. With the arrival of the river steamers in 1853, the small European settlement found itself to be ideally situated as an administrative and commercial centre for the untapped wealth of the vast Outback. For many years Sydney was the only port in New South Wales to handle more cargo than Wentworth. The steamers brought a new sophistication to the rugged river towns. They carried the hopes and dreams of fragile communities for over three quarters of a century. In 1857, Surveyor General Barney considered it time to establish a proper township. The town site was approved in 1859 and was named after the New South Wales explorer and politician William Charles Wentworth (right), on June 21, 1859. The area was proclaimed a municipality on January 23, 1879, and is the region’s oldest settlement. Throughout the prosperous river trade days Wentworth Shire suffered extremes in fortune and dispair. The area suffered floods, droughts, rabbit plagues and overstocking which in turn caused erosion and land degeneration. 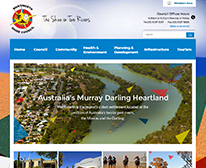 Nonetheless, the settlements continued to thrive and grow at a reasonably rapid pace and by 1929 a series of locks and weirs, to assist navigation and pumping, had been completed on the Murray River. In the early 1900’s the first irrigation settlement in New South Wales was commenced at Curlwaa, seven kilometres east of Wentworth. Irrigation breathed new life into the district which led to pastoral properties being divided into smaller allotments (now referred to as “blocks”). An improved system of road networks, state­wide rail links and motorised transport reduced the need for riverboats as a source of transportation, communication and trade, thus forcing an end to the riverboat era. 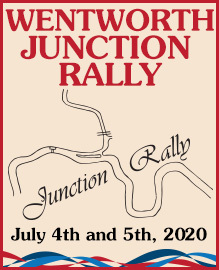 Wentworth continues to be an important centre for the surrounding landholders. It is a town steeped in history and as a tourist area of great diversity. 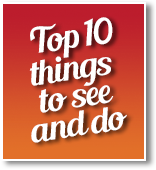 Wentworth has much to offer including; the Junction of the Murray and Darling Rivers, Locks and Weirs, Paddle­steamers and Houseboats, Watersports, Historic Buildings, The Old Wentworth Gaol, Pioneer Museum, Aboriginal Culture and Galleries, Wineries, Perry Sandhills. 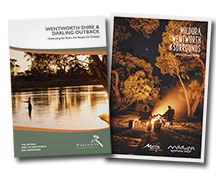 The Wentworth Shire boasts the Australian Inland Botanical Gardens, Mungo National Park and the Willandra Lakes World Heritage Area, unique scenery and native wildlife as key tourist attractions.